The Outsiders by S.E. Hinton is a great book about friendship and not judging people before getting to know them. I really liked this book because it seemed so realistic. Even though the author wrote it more than forty years ago, the problems in the book are problems we still face today. No matter where we go, it seems like people will always be broken into groups based on what we wear, where we come from, or what we like to do. This book taught me that all people are basically the same, no matter where we come from. We can find similarities in each other just as easily as we can find differences. The main characters in this book struggle because all their lives they've been taught to hate other people that are not like them. They also have a problem with judging other people, even though they dont want to be judged themselves. After awhile, the characters begin to wonder what is truly right and wrong. The Outsiders also includes a poem by Robert Frost called Nothing Gold Can Stay. I love this poem because it is about savoring each moment of life and not forgetting that things always change - sometimes for the better and sometimes not. As the characters begin to grow up and change, they experience many sad things, but the final message is about hope. The Outsiders made me think about things that I sometimes take for granted and it taught me that everyone deserves a chance. The book was inspiring because S.E. Hinton wrote it when she was only sixteen years old. It showed me that regardless of how old we are, what we look like, or where we come from, we are all capable of so much. This coming-of-age novel is written by a teenager for teenagers. Susan Eloise Hinton was 15 when she started writing The Outsiders and 17 when it was published in 1967. The Outsiders is often credited as beginning the realistic young adult novel. The story is about of a group of boys, ‘greasers’, living on the east side of Tulsa, Oklahoma in the mid 1960s. The youngest member of the greasers gang is the novel’s narrator, fourteen-year-old Ponyboy Curtis, who lives with his two older brothers Darry (20) and Sodapop (16). Darry works hard to care and support his two brothers after their parents were killed in a car accident – not an easy task for one just out of his teens himself. Sodapop has dropped out of school to work at the gas station, so Ponyboy feels the pressure to be a success at school. He is sure that Darry resents him and lives with the fear that he will be taken away and put in a boy’s home. Sodapop and Darry aren’t Ponyboy’s only family – fellow Greasers, Dally, Two-bit Matthews, Steve Randle, and his best friend Johnny Cade are like his brothers. The Greasers are constantly at war with the rival rich west side kids, the ‘socs’ (socials). This feud turns fatal one night when a group of Socs corner and attack Ponyboy and Johnny in a park. Francis Ford Coppola adapted the novel into a film of the same name, released in 1983 starring C. Thomas Howell, Matt Dillon, Ralph Macchio, Rob Lowe, Patrick Swayze, Emilio Estevez, Tom Cruise, and Diane Lane. Hinton makes a cameo in the film as a nurse. Film is worth a watch after reading the book. 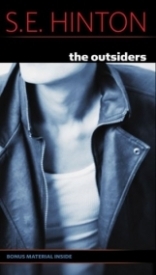 The Outsiders is a frequently challenged book and has been banned in many schools and libraries due to its portrayal of gang violence and underage smoking and drinking. Although today it is often a studied text in many high schools, which is fantastic because while the lingo may have changed it’s still as relevant today as it was in 1967. I thought this was an amazingly written book. It expresses a lot of emotion and it shows close friendships that means a lot. And showing that you can be friends with anybody no matter what crowd they hang out with. I also think anyone who reads it will fall in love with the characters. Yet another classic YA book, which holds the special distinction of being written not only by a teen, but by a -female-. That alone was an enormous source of inspiration and encouragement for me over the years. At the time that I read it, I recall appreciating the author's knack for conveying action -and- emotion, without one weakening the other. What always amazed me about this book was the fact that it was vivid and believable, in spite of the fact that the author had no personal experience with 'gangs' of the era. She paints a lively portrait of the dynamics between social strata, and the complexities of relationships and loyalties between close male friends. If I hadn't known better, I would have assumed this stemmed from direct knowledge. all the book is awsomeeee! i enjoyed a lot. you really wanna read this!! I go to an online homeschool and I am given a list of books I have to read for that year. I hadn't looked over it since the start of the year and the middle of the year is upon me. I have another kid in the same online homeschool over at my house doing school with me. He has to read a book called `The Outsiders by S. E. Hinton' I had never heard of it. One day, he is lying on the floor reading it, my sister is sitting on the floor next to him doing history, and I am on the computer trying to figure out what subject to do next. I decide to look at my reading list. One of the books on there is `The Outsiders'. I turn to my friend and say, "Hey, Geoff. What book are you reading?" He looks at me and say, "`The Ousiders by S. E. Hinton, why?" I ask him if I could read it for school, too, and he agrees and says he will leave it with me tonight, trusting I will keep the library book safe. I begin reading it, not thinking it would be that good. I end up reading the whole book that night. Geoff gets there the next morning and I hand him the book. He says he will take it tonight and leave it here the next. I tell him, "Thanks but I read the whole book last night." He stares at me wide-eyed for a minute. "It was really good," I tell him shrugging. "Yeah, it is," he agrees, shrugging. Then we all walk upstairs and begin school. Thanks to that 11 year old boy, I read The Outsiders. I hope anyone that reads it, likes it as much as I have. The Outsiders S.E Hinton GREAT BOOK !!!! The Outsiders By S.E Hinton is a spectacular novel. It deals with challenges in life and how to over come them. Who's a good friend and who's not. The main character is a boy named ' PonyBoy Curtis. He lives with his two older brothers, Darry and Sodapop. Their parents died in an accident. The boys are barely making it by, but they have friends to help them through it. Their friends are like a gang. Always stick by them even when trouble comes. The boys are called "greasers"; they are poor and come from broken homes. And socs are the rich, "upper class' kids. They drive nice cars, dress nice, and they think their better then everyone else. My favourite character from the Outsiders would have to be Dallas Winston. He is the toughest greaser in their gang. Dallas has blond hair, blue eyes, and doesn't put grease in his hair. Dally takes pride in his criminal record. And wouldn't let anything happen to Johnny or Pony boy. I like his character because he is the bad boy. All the girls want him. He's mysterious, and tough. Acts like a jerk but deep down isn't. I would recommended this book to everyone who hasn't read it before. S.E Hinton is a great author who writes awesome books. Its interesting how she uses her intials instead of her full name. So no one knows if she is a boy or girl and would read the book. The Outsiders by S.E. Hinton is a book the author wrote while she was still in high school in the south and it is roughly accumulated on her own life. The story takes place in a minor, rural town in the 1960s. The two chief groups in this story are the Greasers, like Ponyboy, and the Socs. The Greasers are deprived, humble, less educated and hard-hitting. They wear grease in their hair -- hence the name Greasers. The Socs are prosperous, know-it-all high school students that do corrupt things and still miraculously get away with them. Ponyboy and his friend Johnny are the main characters; both of them are Greasers. They went out one night to sit in the park. During this time, the Socs came over and stared to fight with them. While they were fighting, one of the Socs began to drown Ponyboy in the nearby fountain. To save Ponyboy's life, Johnny kills the Soc with a switchblade. After fleeing the scene to a friend for help, they leave their town in arrears to go to an abandoned church far out of the way from what might become of them. One night, when they were heading back towards the church, they noticed that it was aflame. In attempt to go in and then back out of the now burning church, both get injured so severely that they have to go to the hospital. Later that night, Dally, a Greaser who is Johnnys role model in so many ways, robs a convenience store and gets in a misfortune. To find out the fate of these three, read The Outsiders. This book appealed to me because it kept me locked in interest. I hated putting it down and only did so when totally necessary. I would recommend it to everyone that is looking for a good read because the book is so tantalizing. Its truly a wonder how a sixteen year old girl could write such a fantastic novel. But S.E. Hinton did so and I am glad that I got to read her work. I give it five stars and a wish to read more novels by this author. The Outsiders was the book I had to read for my 8th grade L.A. class, and I couldn't help but not be exited because we have a tendency to read books that I dont find interesting. As soon as I was handed this book though I had a feeling it was going to be different, and it was. This book has all of the qaulitys that makes it a great read, action, adventure, witt, comedy, heroicness, and much more. You really get to know the characters and you can sense a strong bond between the friends. This book has alot of forshadowing, and when you think somethings going to happen the story veers off into another direction usually adding another problem to the story. Because of this book I now have high exspectations for my class reading for the rest of the year, exspectations I know no other book will meet. The Outsiders . Hinton, S.E. New York: Penguin Group, 1967. 180 pages. Looking for a breathtaking book? If so, The Outsiders is a fiction novel by S.E. Hinton that is just for you! The book is written in first person point of view and is told by the main character Ponyboy, so you are able to hear things through his thoughts, and you get to know how he feels about the rest of the gang and the situations that are happening. Ponyboy is a 14-year old boy who lives with his two brothers because their parents died. They are always trying to make sure that Ponyboy and one of his brothers named Soda do not have to go to a foster home due to getting in trouble or doing something wrong. The three brothers and their gang all protect each other from their rival gang known as the Socs. The Socs often times jump Ponyboy and his gang, who are known as greasers because they heavily put on a lot of grease in their hair all the time. The purpose and theme of the book is to show kids how when times are tough you have to find people who will accept you for who you are and who you can trust. Once you find those people you must stay close to them. The author shows that not all things in life will turn out the way that you want them to be. The intended audience is people who take what they have for granted or people who want to know more about what life is like for people in a gang or with troubled pasts. S.E. Hinton did a great job of showing that we shouldnt take the things and family members that we have for granted because some people do not have family members or have lost many people close to them. She also showed that the necessities that some people have, others do not have, so we should be thankful for everything we have. We need to realize when we dont think life is fair, that there are many others who would love to have our lives so we should be thankful for the life that we have now. The book really made me appreciate how great my family is, and all of the things that I have and the resources that I have in life. I think that all people from the age group of mature middle school kids and older should read this book. There is a little bit of profanity in the book which is why I recommended this age group. There are too many exciting events to count! You are left on the edge of your seat for every scene, and after one great scene you sped right on to the next one. The adventures never end in this book! The book is truly amazing. You have to read it for yourself to find out if Ponyboy and his brother, Soda, do get sent away from their other brother Darrel, (known as Darry) to a foster home. Youll also want to find out if they ever end up getting rid of their arch rival the Socs. The book is fantastic and everybody should read it!